"I tried Pepto-Bismol on a recent trip, and it really worked. 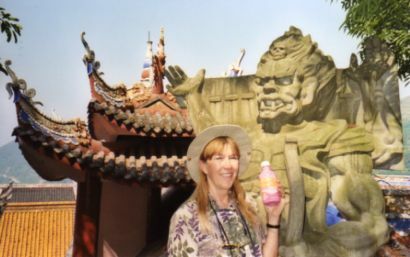 Now I want to read all of your travel tips…"
...Something like two tablespoons of the pink stuff four times a day. Well, I figured it couldn't hurt to try it. ...tourista anywhere the water was different. We started packing Pepto-Bismol, and lo and behold, Mark hardly ever got sick. Check out our stories about travel health in Bhutan and China. We didn't take it the way that old doctor suggested... it was hard to do that when we were out and about and away from our room. What we did was this... we would take a swig in the morning and one at night. 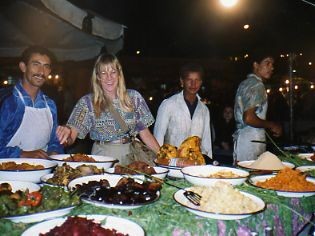 And more often when we were less cautious with what we ate. The CDC discussion below will tell you that Pepto-Bismol tablets are effective too. On this I'll just say that we used to be superstitious. We always took the liquid.... with tablets as back up. I know that's silly, but it's what we did. With today's security rules on packing liquids and medications, I've changed to the tablets. Pepto-Bismol is considered a medication, so theoretically you should be able to take a big bottle, but who wants to chance it? With the tablets, you can pack as much as you want... more than just 3 ounces! 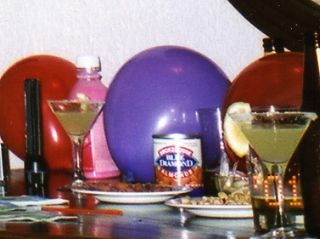 See the pink bottle of Pepto-Bismol hiding among the balloons? 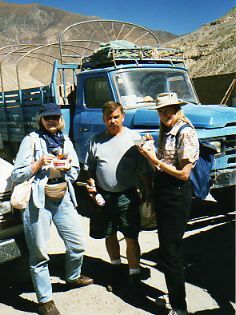 One time traveling with a group of friends in Ladakh in the north of India, we loaned our Pepto-Bismol to a friend who was having troubles with tourista. We've read that if you miss a few doses the liquid's effectiveness decreases. It must be true. After a couple of days without the pink bottle, Mark told me to get the Pepto-Bismol back... and soon everything was fine. To be really safe, the tried and true travelers' rule is to eat it only if it's peeled or boiled or well cooked.... another rule I'm afraid we break more often than we should. 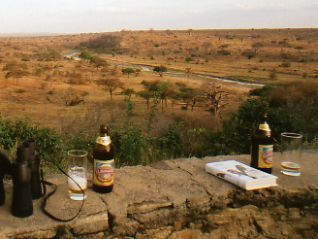 And we eat salads even on safari or in the jungle or traveling overland in India or Tibet. Sometimes it's just because it seems like the thing to do at the time as in the Djemaa El-Fna square in Marrakesh, Morocco (above). So we make it a habit to eat yogurt when we travel. And to drink beer. Who'd of thought beer was good for you? Wine works well too... and we're Californians so we love our wine. You do have to be careful with the water in many places. 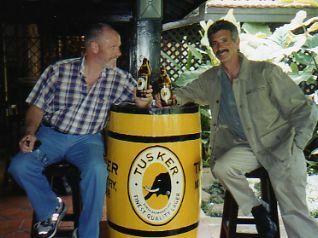 You can always order bottled water with your meals, but we enjoy trying the local wines and beers when we travel... always in moderation, of course. Now I can't say that any of this will work for you, but I pass it along because it has worked for us. ....Studies show a decrease in the incidence of TD (Travelers' Diarrhea) with use of bismuth subsalicylate ... ...Several studies show that bismuth subsalicylate taken as either 2 tablets 4 times daily or 2 fluid ounces 4 times daily reduces the incidence of travelers' diarrhea... ...prophylactic bismuth subsalicylate should not be used for more than 3 weeks. Obviously you've figured out that "bismuth subsalicylate" is Pepto-Bismol. For the full discussion, go to the CDC site for Travelers' Diarrhea. The CDC site for Travelers' Health is full of information on other diseases. Be informed, but don't let it scare you off! Go ahead and get off the beaten path.... just take all the precautions you can. The CDC also addresses that other question, "Do I need SHOTS?" Click on THAT question for our page on international travel health vaccinations. We have pages on foreign money matters and rental car tips and general travel safety tips. Remember, it's all just preparation.... none of these discussions should worry you too much. Go and enjoy. Just remember to pack your Pepto-Bismol.